Sault Ste Marie Real Estate Board President presenting grant cheque to the Finnish Rest Home. Trillium Childhood Cancer Support Centre "Camp Trillium” - Cheque in the amount of $1,000.00. A single family bungalow and two semi-detached homes were completed on Nantes Street in Ottawa’s east end in 2013 thanks to funding from the Ontario REALTORS Care® Foundation. The homes were purchased with interest-free, long-term mortgages by three hard-working, low-income families and made a positive impact on the lives of nine local children. The bungalow was specially designed to meet the needs of the entire Caceres family, but a special emphasis has been placed on ensuring that this home will be safe and comfortable for their eight-year-old daughter, Amanda. The grant funds that the Ontario REALTORS Care® Foundation has generously donated will be used to support the Transitional Living Program. The Transitional Living Program gives women a place to settle and rebuild their lives after traumatic experiences. Your support helps women during some of the mots difficult times of their lives by providing a roof over their head and a door to lock behind them. The program provides Hamilton's most vulnerable women with the dignity they deserve by offering them safety, security and support. Sara Peddle, Executive Director, David Busby Street Centre, Barrie - Barrie & District Association of REALTORS® President, Wendy Elzner: Cheque presentation from the REALTORS Care Foundation presented at a General Meeting. The David Busby Street Centre, Barrie is extremely grateful and the Barrie & District Association of REALTORS® is extremely proud to present them with this donation. Carolyn Mills, Sweet Dreams Charity - Peter Ward, Peterborough and the Kawarthas Association of REALTORS® 2013 President - Wendy Giroux, Peterborough and the Kawarthas Association of REALTORS® Executive Officer: Sweet Dreams donated over 8000 pairs of pj's and nightwear to local charities in cluding Crossroads and Kawartha Haliburton Children's Foundation. REALTORS® Giving Back: on Wednesday, December 11th, 2013. Niagara Association of REALTORS® 2013 President Dawn Kendrick presented donations to Hospice Niagara and YWCA of Niagara in the amount of $4,616 each on behalf of the Ontario REALTORS Care® Foundation. The 2013 President of the Niagara Association of REALTORS®, Dawn Kendrick, presented a donation of $9,616 to Karen Dolyniuk of Habitat For Humanity Niagara. Members of the Timmins Real Estate Board raised upwards of $12,360 in their monthly donations to the Realtors Care Foundation and from funds raised at their two Ontario REALTORS Care® Foundation golf tournaments. The money was divided evenly between three local charities: the Costello Centre, the Jubilee Centre and the Pavilion Family Resource Centre. 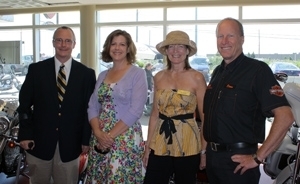 On Wednesday July 13, 2011 the Durham Region Association of REALTORS® (DRAR) hosted a BBQ lunch at Mackie Harley Davidson for the Ontario REALTORS Care® Foundation Motorcycle Ride for Charity. "The BBQ was a success and a lot of fun," said Durham Region Association of REALTORS® President, Dierdre Mullen. "We were very happy to have Oshawa Mayor, John Henry and Oshawa MPP, Jerry Ouellette join us for lunch as well as many Durham REALTORS® who came to show their support."